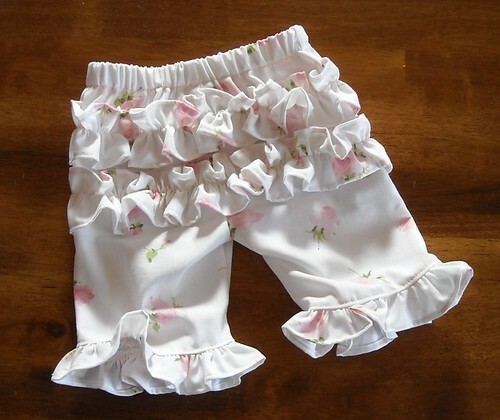 Aren't these cute little pants? I made them from a sheet I got at Goodwill. 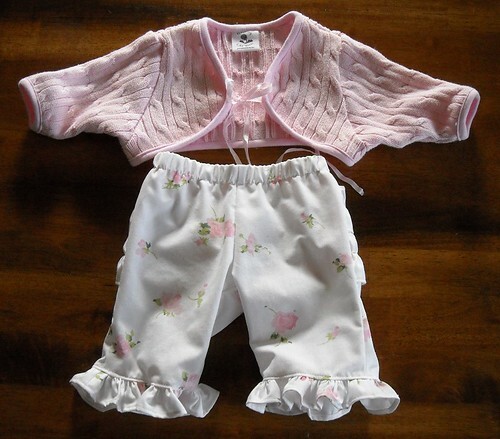 I also bought a sweater there to refashion into a tiny sweater for my girl. The sweater pattern is from Ottobre 1/2007. I had to shorten the sleeves a bit, and then taper them a little more towards the wrists but I think it will work well for Lauren through the spring and summer. 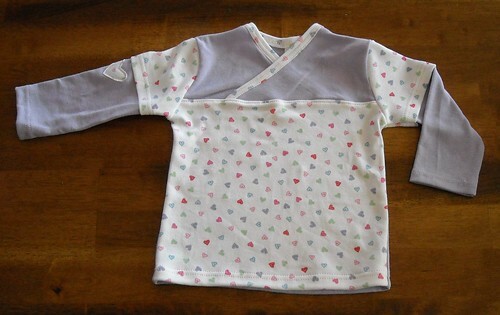 The binding on the sweater is from the blanket I used to make these shirts. I was glad it was a close enough match because I still don't have any solid pink knit fabric. I also got my Geese in the Forest blocks for February done this week. These were fun to put together and I'm looking forward to the next block pattern, it should be available next week. If there's anyone that wants to swap some scraps for this quilt, let me know. There are some colors I have lots of but I do have some holes in my little stash (I could use reds, oranges, aquas, and I could trade purples, greens, maybe some yellows, and more). 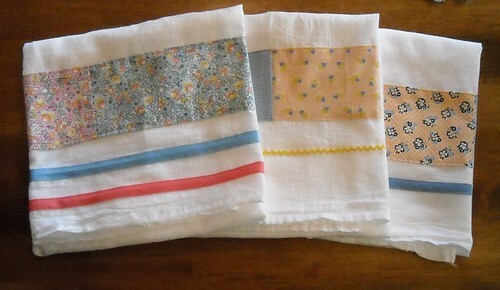 Finally, I wanted to show off the dishtowels I made for my sweet mother-in-law, for her birthday. Happy Birthday Terri!! The dishtowels are from Target and I embellished them with 30's reproduction fabrics, and some vintage bias tape and rick rack my mom gave me a while back. Today I started the Geese in the Forest block of the month project by Anina at Twiddletails. I've got a yellow block and a lavender block done, and fabrics picked out for green, blue, and pink. I need to look through my reds and pick out some pieces for a red block, too. I'll post another picture with better lighting soon. Hello Betty--I like the 30's colors and the modern ones too. Neptune--I really like this one a lot. I love the kelp shapes in the "Pacific Paisley" print. 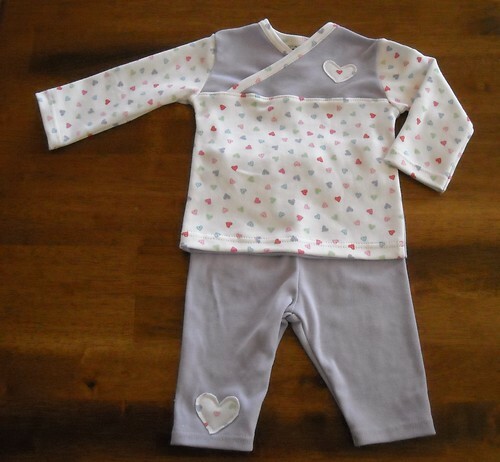 I like all the Basic Grey lines--Sultry has some prints that would be perfect for a baby girl's dress. And I just discovered the Christmas fabric sneak peeks--look at this Figgy Pudding fabric. I really like the trees, and the snowflakes. So gorgeous. I'm also thinking about Mountain Baby Blankets. Rachel is collecting handmade baby blankets for teen mothers in Appalachian Kentucky. I think I'll work on a simple quilt for this, starting this week. I finished it! I am still probably going to take some more photos and post them but these are the finished pics so far. I really like how it turned out. There are lots of special or memory fabrics in this quilt--fabric from the dresses my mom made me and my sisters for Jim and Marilyn's wedding. When I was 10. We served and I remember they had hot cider for drinks and they used glass plates and little glass teacups. I think some of the younger girls may have dropped and broken a plate or two that night. We wore cute sheer aprons too. And there is fabric from the shirt I made for 4-H when I was 12. This was the only 4-H outfit that I really liked out of 4 years of sewing for 4-H. I made an oversized button-up, collared shirt out of a lavender/aqua print, and matched it with lavender stirrup pants. 1986. There is sky print quilting fabric that I used in one of my oldest son's baby quilts. The first quilt I did meandering quilting on. Pink valentine print from the valentine pj pants I made myself 2 or 3 years ago. I'm wearing them right now. Pink and white big plaid that mom bought for me to use when I made Shelly's girl's baby quilt. I think I used the tiny lavender gingham in that quilt too. I don't have a picture of that quilt, Shelly, can you send me one? The purple fans, the yellow floral print, and the light green and white print are all left over from the queen size quilt I made about 7 years ago. 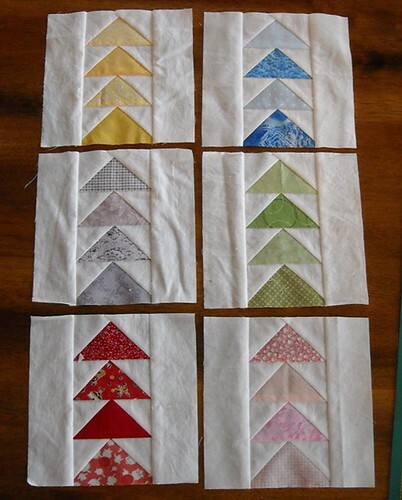 It had big flying geese blocks with 4-patches in the flying geese and a smaller flying geese border. I'll have to post some pictures of that quilt. Unfortunately I don't really love it; I'd say that at least 3 of my really early quilts show that I had a poor understanding of color and value. There is more pink and a small bit of burgundy fabric from a mystery quilt that I did on sewingmamas.com in 2006. I entered it in the county fair here, won 3rd place in my category, and got a $1 prize. I don't think I ever photographed that quilt either. 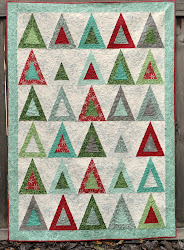 Oh yeah, there is also mint green fabric from Savahna's quilt, the first baby quilt I made. She's my oldest niece and just turned 11. I'm pretty sure the light blue solid is from Shelly's boy's quilt. And the light green solid is from Jacob's baby quilt. And, I found the leftovers from Clara's quilt after I'd already finished the quilt top but before adding the border, and was able to use part of the purple leftovers in the border of this quilt. I wanted to do a pieced back but not get too wild and crazy. I'm really happy with how this came out. I haven't measured it yet but it is bigger than the baby quilts I am used to making. I think it is around 45x70 inches or so. 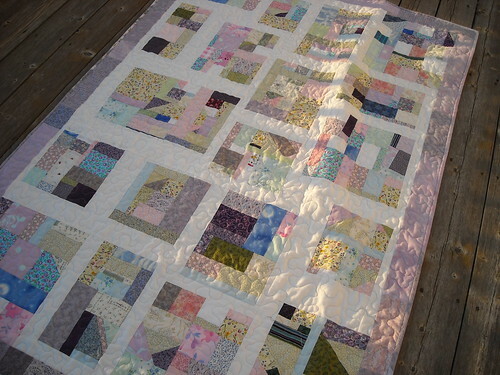 I will probably make another scrap quilt similar to this someday, but I will not do the randomly sized blocks again. It was a lot of thinking and work to get it to all go together. I'm glad I did it once though. Thanks to Jacquie for heading up Project Improv and encouraging improvisational quilting! 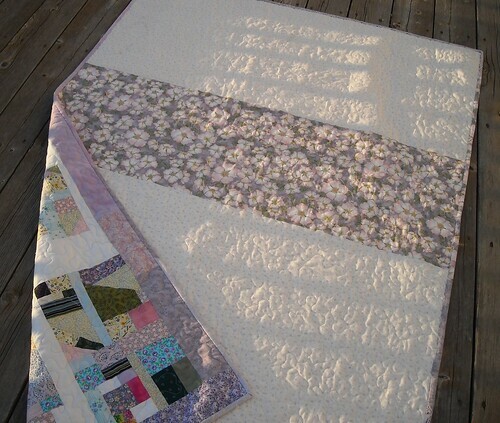 I finished up the quilting yesterday and am working on binding today. It's going to feel good to finish a big project like this.